Scientists in the UK have made metal-containing thin films that can be incorporated into wound dressings or on surfaces to kill microbes and bacteria in hospitals. 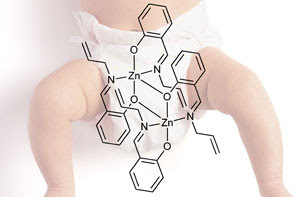 Andrew Johnson, at the University of Bath, and colleagues created the antimicrobial films from zinc and copper Schiff-base complexes incorporating ligands made by reacting aldehydes with primary amines, which they then deposited onto polypropylene fabric commonly used in nappies and bandages. The team found that the copper and zinc complexes were good at killing microbes, and when tested against Staphylococcus aureus (which, amongst other things, causes impetigo - a bacterial skin infection - and toxic shock syndrome) and Pseudomonas aeruginosa (causes inflammation and sepsis), they were found to be highly effective, limiting bacterial growth for up to 16 hours. Techniques to reduce the prevalence of these particular bacteria are needed as they are known for their antibiotic resistance. The zinc complex was found to be particularly successful, but the reason for this is not yet known. Johnson and his team speculate that it may be due to the toxicity of the Zn2+ ion and at higher levels may be due to transmetallation, in which the complex exchanges zinc for other vital metals in bacterial cells. Silver is a commonly used antimicrobial metal, but it is expensive so Johnson has spotted an advantage for his zinc and copper-based materials: 'As only a small amount of the zinc monomer is required to deposit the films, it should be easy to scale up for industry and, most importantly, it will be cheap.' Another advantage is that the 'coatings are a post production treatment, so from a commercial perspective, we are not changing the manufacturing process for commodity bulk items such as bandages,' he adds. Johnson's team now hopes to improve their films to apply them to medical devices such as catheters, wound dressings and personal care items. In particular, they are working with the paediatrics burns unit for the south-west of England at Frenchay Hospital, Bristol, to further develop their materials into advanced wound dressings for burn victims.